Speed reading must be a sport, and if it is not, Spritz will certainly make it so. The company is developing the tools to help readers read faster, by eliminating the reader’s need to move their own eyes. In fact, Spritz recommends relaxing a bit more… in order to allow the app to lull you into faster reading. According to Spritz, the software application helps users by changing word positioning – all words are now center aligned onto the reading space. Visually, this helps the eyes by eliminating the need to follow a sentence, or a paragraph, or perfectly manicured spacing. Sorry, poets. Now, with compact text streaming from Spritz, content can be streamed one word at a time, without forcing your eyes to spend time moving around the page. Spritz makes streaming your content easy and more comfortable, especially on small displays. 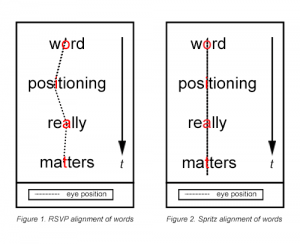 Our “Redicle” technology enhances readability even more by using horizontal lines and hash marks to direct your eyes to the red letter in each word, so you can focus on the content that interests you. Best of all, Spritz’s patent-pending technology can integrate into photos, maps, videos, and websites to promote more effective communication.